This shot was taken from the aboard the Liberty Clipper– one of the Tall Ships anyone can buy a ticket and go out on a three hour tour. Three, hour, tour… did you hear the Gilligan’s Island theme song?! 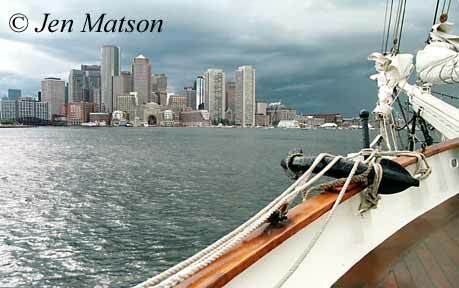 It’s a fun trip around the harbor, and you can help the crew with the sails if you wish. This day, they saw that thunderstorm coming and turned us around early. We didn’t make it back in time; got drenched just outside the slip. But the storm made for a cool sky and interesting light, so it was worth it!